Ant-Man is a pretty watchable light movie, but ah, it could have been a Wright movie., says Raja Sen.
Siri, confounding in that sweet, untimely way of hers, decides to obey an unsaid command and plays Disintegration, by The Cure. Over the last few years, the Marvel Cinematic Universe has buffed the superhero story into a squeaky-clean template, but the blockbuster goalposts keep moving. At a time when we’re coming alive to the cheeky action stylings of Kingsman and the exposition-free awesomeness of Mad Max Fury Road, can an Ant-Man movie drop our jaw and make us say wow? So, no, we don’t care if honey, you shrunk the superhero, and no, we don’t fear a supervillain best sized to ruin picnics. The wow simply will not happen. The good thing is that Marvel knows it, and thus hands us a surprisingly slack and refreshingly modest superhero film. Paul Rudd, who we love ever since he crushed on his blonde stepsister in Clueless two decades ago, is the incredibly unlikely man in the suit. The entire film is a deliciously old-school heist picture -- the kind of heist film where Roy Ayers’ Escape theme from Coffy kicks in every time plans are being hatched, in fact. It is also rather unmistakably a heist film mostly for children, and thus a film that is never clever enough to be genuinely surprising or enjoyable. There are moments of fleeting fun -- including toys blown up to larger-than-life size, and Michael Douglas digitally retouched to look so young you feel Sharon Stone must be contorting her legs somewhere nearby. But this film, while passably entertaining and pop-up-book thrilling in 3D, is by no means anything special even though it sufficiently sets up a potentially endearing character (or two). 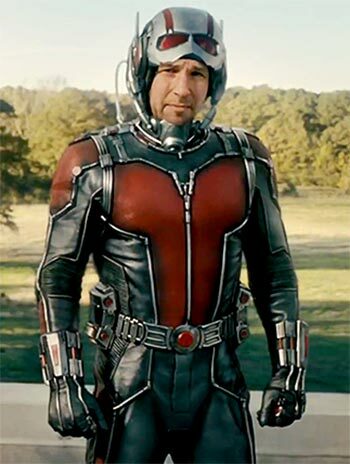 Ant-Man, directed by Peyton Reed, was originally an Edgar Wright project before that terrific director was taken off the project. It’s all rather heartbreaking, and while the script still retains his flourishes (and screen-credit), the overwhelming feeling is one of squandered promise, despite the scene-stealingly good Michael Peña. Ant-Man slides around the grooves of a record spinning frantically in a nightclub. But it’s all a bit been-there-done-that, a bit Eega, even.